Looking for performance on a budget? We get you the answer. Small capacity motorcycles can be quite boring, especially when you dial in the fact that those engines are tuned to return the best possible efficiency. That said, there are some motorcycles that’ll get you from A to B without burning much fuel and also make you smile everytime you ride them. 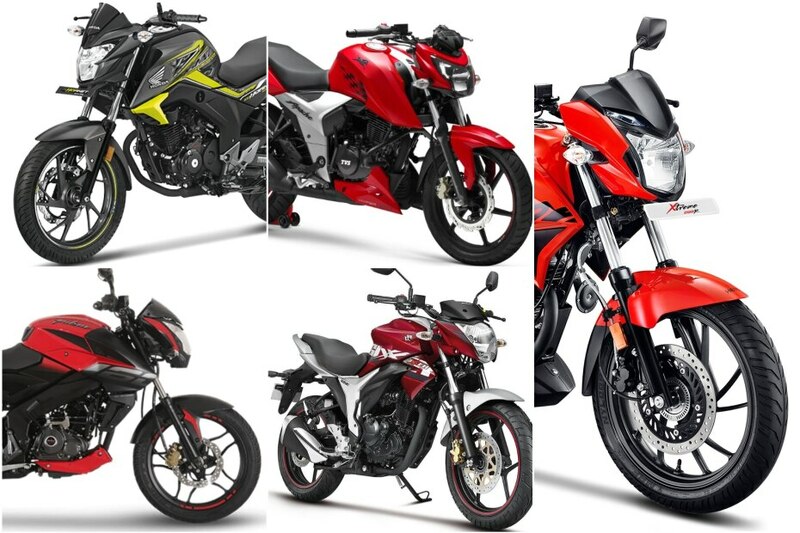 With Indian buyers gradually, but certainly shifting towards more powerful, sporty commuters, we’ve compiled a list of top five bikes that fit the bill perfectly according to us. The Gixxer series did wonders for Suzuki in the Indian market. It also allowed the company to gain some perspective on the country’s youth-centric market which is essentially why the manufacturer recently decided to shift its focus to higher capacity (150cc and above) motorcycles. The Gixxer isn’t any different from the standard model, aside from the addition of ABS. Both the Gixxer and SP are powered by the same 154.9cc motor that makes 14.8PS at 8000rpm and a peak torque of 14Nm at 6000rpm. Though the motor has a displacement of 154cc, it has enough power to compete with its 160cc counterparts. That said, it’s still low on power compared to other bikes available around the same price range. Even though Honda has earned a name for itself as one of the most reliable two-wheeler manufacturers in the market, but the same can't be said about its design approach. Hence, with the CB Hornet 160R, the Japanese bikemaker took a more youthful approach which worked in the company’s favour. The result is an aggressive looking bike that appeals to the masses. Besides its sporty looks, the Hornet 160R packs a 162.71cc motor that generates 15PS of power and 14.5Nm of torque. It comes mated to a 5-speed gearbox. The Pulsar NS160 may look identical to its elder sibling, however, its engine, gearbox and tyres are all new. Its 160.3cc, single-cylinder, liquid-cooled motor makes 15.5PS at 8500rpm and 14.6Nm at 6500rpm which is just 0.5PS and 0.1Nm more than the CB Hornet 160R. Though the NS160 is neck-and-neck with the Hornet 160R when it comes to power figures, the former can be pushed harder, thanks to its free-revving engine. Moreover, it undercuts the standard Hornet by around Rs 200, which doesn’t sound like much, but does give the NS160 the upper hand. If you’re looking for a smashing little commuter that can do it all, the Apache RTR 160 4V is the perfect tool for you. The bike is probably the best thing that came out of TVS’ stable last year and still manages to keep us smiling every time we hop onto the saddle. Be it daily commutes, touring or just pushing it hard through corners, it’ll do it all. Powering this pocket rocket is a 159.7cc, single-cylinder, fuel-injected motor that produces 16.8PS at 8000rpm and 14.8Nm at 6500rpm. The RTR 160 4V’s punchy engine makes it the most powerful bike in its class, however, you could get your hands on yet another bike that not only undercuts the Apache RTR 160 4V in terms of pricing but is also more powerful. When you think of a 200cc motorcycle, you wouldn’t think it would be as affordable as a 160cc bike, would you? But that’s exactly the case with the Xtreme 200R. Granted, it's not an outright performer like its 200cc rivals, however, it’s been positioned as a usable everyday commuter with just the right amount of grunt. Powering the bike is a 199.6cc, single-cylinder, air-cooled mill that pumps out 18.4PS at 8000rpm and 17.1Nm of torque at 6500rpm.